Signed and dated l.l. corner, brown oil "ARTHUR STREETON/ 1896". Ted Gott, Australian Impressionism , ''Gently I wave the visible world away': Charles Conder, Arthur Streeton and the 'Problem Children' of Australian Impressionism', pg. 239-247, Melbourne, 2007, 342, 259 (colour illus.). cat.no. 13.11 Note: Alternative title used. Anne Gray, Sydney Long: the spirit of the land , 'The spirit of the land', pg. 45-70, Canberra, 2012, 49, 50, 51 (colour illus. ), 60, 85, 137. 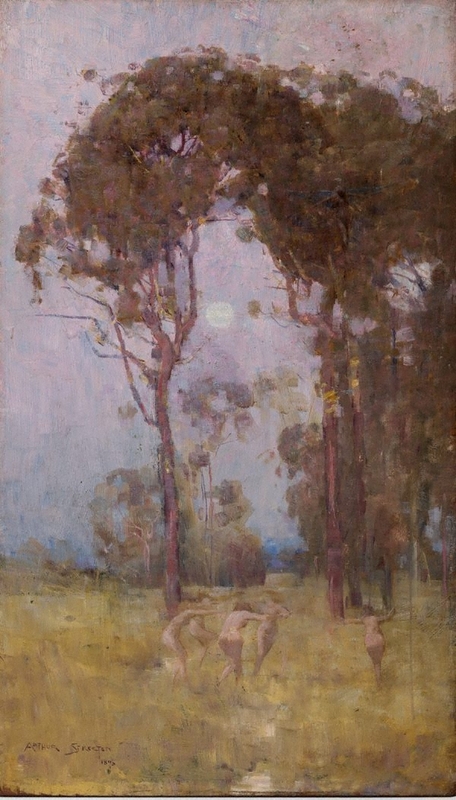 Anne Gray, Tom Roberts , 'Harmonic arrangements: Tom Roberts' painting', pg. 31-60, Canberra, 2015, 48 (colour illus. ), 350. Denise Mimmocchi, Australian Symbolism: the art of dreams , ‘Dreams of the bohemian idyll: Charles Conder and his impact’, pg. 90-110, Sydney, 2012, 92, 97 (colour illus. ), 147. Loan exhibition of the works of Arthur Streeton , Sydney, 1931.